Like many other forms of international cuisine, Japanese food has become very popular all over the world and there’s hardly a small town anywhere in Asia or the developed world that goes without it. The authenticity and quality of Japanese restaurants varies, though, and quite often what I call imitation Japanese serve the needs of the masses. The ultimate tools to telling whether you’re eating real (good) Japanese food are of course your own senses and some experience, but not everyone has developed their taste buds or knows what they are talking about. So here are a few perhaps interesting indicators suggesting that you’re in a real (or at least a good) Japanese or not, in particular in Thailand, that I've picked up during many visits to Japanese restaurants not only in Thailand but also elsewhere in the world. If the owner is a Japanese (perhaps married to a Thai), chances that you get a more authentic taste are surely much higher than when the place is purely Thai-run. Still, quality is not guaranteed because some Japanese also lower their standards and source cheaper ingredients to target the mass market. However, in trying tons of places in Chiang Mai, I've rarely come across a real decent Japanese which is 100% Thai-run (in fact I only know of two exceptions, Suntori and Sushi Ichiban). If you want to know more about the food, make it a habit to always inquire about the background of the place and who is the owner. You could say the clientèle are a reflection of the atmosphere and owner of the place, like attracts like. Imitation Japanese are often crowded by Thai youngsters craving the taste of a hype, not with their tongue but with a smartphone to share it on social media. The cheaper the better, but then some of imitation Japanese (Grill Jung) aren't that cheap after all, following the trend can be expensive. If there are quite a few Japanese customers, that’s a better sign. Roughly, you can see three different classes of Japanese going to Japanese restaurants in Chiang Mai: the middle managers, the top managers (directors) and the retirees. Quite often, those three classes frequent different places, partially perhaps for social reasons but also because of budget. Japanese retirees tend to accept some lower quality copy-Japanese, maybe just because they want to eat something else than Thai food. The middle and top management go to the better places and in some places you see more top management. Interestingly, no Japanese restaurant in Chiang Mai ever tops the list of Tripadvisor favourites, which to me proves the irrelevance of such reviews and sites. Most likely, the average traveller doesn't have the budget (to spend more than 500 baht), doesn't have the interest (Thai food is preferred) and doesn't have the knowledge the find hidden jewels which are located at more than a stone from their guesthouse. Every cuisine has a few important dishes that are perhaps famous or standard and that you can use to test the level of competency of the kitchen. For Thai food, this could be a panang curry, a somtam, or a tom yam goong. For Japanese, threshold dishes could be: miso soup, Japanese rice or sushi rice, and sashimi of course. If the kitchen messes up the miso or the sushi rice, then I know they probably can't do anything special with the rest of the food, so I forget all about it, don't order anymore or leave as soon as I can. As fish is so quintessential to Japanese cuisine, the variety and quality of the raw fish (sashimi) deserves special attention. 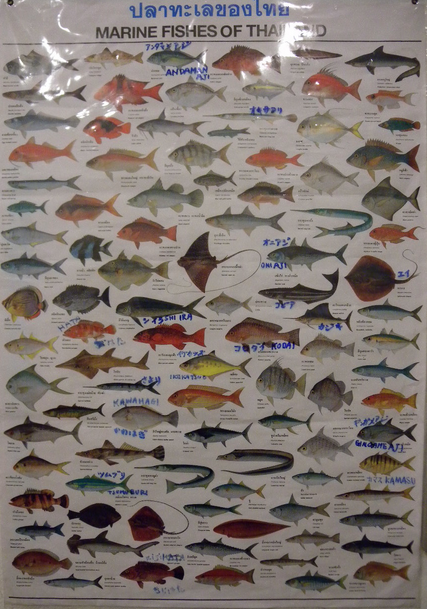 Without fish, there is hardly anything left of Japanese cuisine, without raw fish a pillar of the house is gone. A friend of mine is vegetarian and sometimes invites me to eat Japanese with him, which I'm reluctant to do because going vegetarian Japanese there really isn't that much left of what Japanese food could be (unless you go Japanese macrobiotic). What you often see in average imitation Japanese is a standard selection of just a few kinds of fish and seafood: salmon, tuna, saba and perhaps shrimp or squid. And answer the following question to yourself: do you really think that serving a couple of standard fish (like salmon, tuna and saba) is anything out of the ordinary and can give you a local taste experience? Any sensible food lover will agree that the answer to that question is: no. 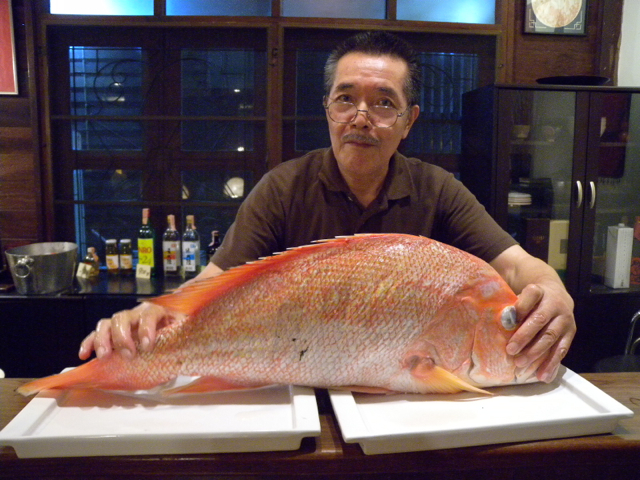 Some owners of the best Japanese restaurants in Chiang Mai make the effort every 1-2 weeks to drive down south to the sea to get the fresh catch from the fishermen's nets, and back up to Chiang Mai again with a few temperature-controlled containers, a drive of at least 20 hours just to please their customers. Of course this cannot compare with the few things you get on your plate in the average mall Japanese. Besides the quintessentials of Japanese kitchen, raw fish and so on, a few of my favourites are typical Japanese dishes such as natto and zaru soba. They are rare, because not everybody likes it and so the typical imitation Japanese doesn't have an interest to serve it. 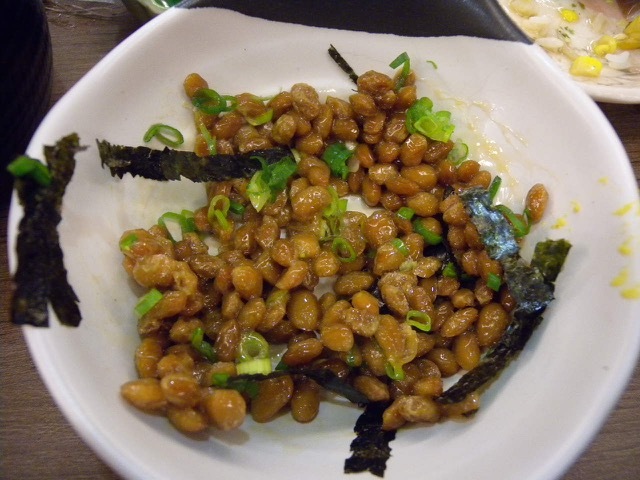 Natto is a slimy, perhaps awkward looking substance of fermented beans that spins a thin line of sliver when you take it up from your bowl with your chopsticks. Awkward it may seem, it's actually very healthy and genuinely Japanese. 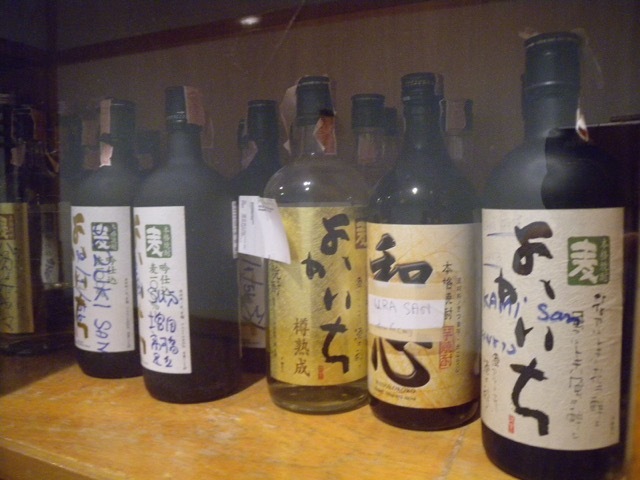 Most real Japanese restaurants have it on the menu (and in fact you can buy it at Rimping super market). Zaru soba consists of buckwheat noodles first cooked, then chilled and served cold with wasabi and other stuff. Truely yummy but unfortunately not available everywhere. Know your Japanese to get it. 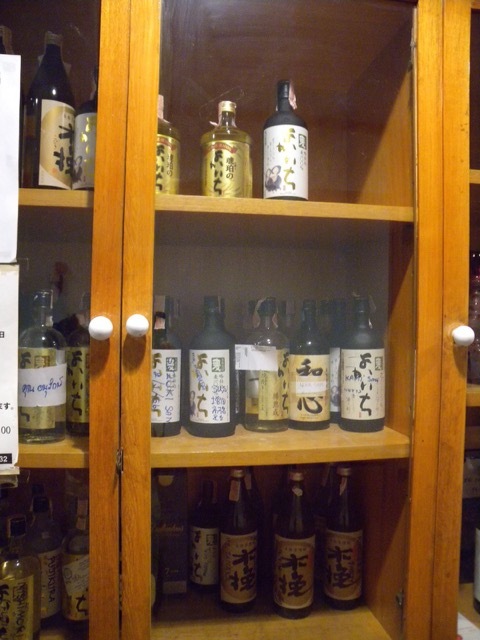 Besides more authentic food, things you tend to find in the better Japanese restaurants are a few shelves for manga books and another few for sake (Japanese rice wine). Interestingly, they often make up the background scene of such places: the manga books await the lonesome Japanese diner who relaxes from a long day at work and the bottles of sake are stored by name of the customer who bought one and will finish it the next time. Another all-timer favourite I often find in real Japanese is good old Kikkoman, the preferred soybean sauce of many restaurants. Not a must, but a feeling of recognition when it's on the table. Excellence can be achieved when the owner of the place is in his business, often he's the one cutting the sashimi because it's said it's an art to cut the fish into proper slices. Part of the charm of Japanese restaurants is in their cozy elegant and boutique atmosphere, often family-run businesses that strive to provide the best to its customers. There are some Japanese chain restaurants out there that do okay but I still prefer the small scale and personal touch of the owners at the premises. Quite the opposite of what is aimed for, fancy food such as sushi-with-Gouda-cheese or Tom-Yam-Ramen fusion food and so on is a warning sign that you're not in the right place and that the food you get is neither authentic, nor good. Cheese is a concept alien to the Japanese kitchen and I don't find it very matching with raw fish, for example. The better Japanese restaurants distinguish themselves not in fanciness, but in simplicity, the art of minimalism, everybody who's been to the famous Zen temple in Kyoto or who has seen the documentary about Sushi Jiro knows what I'm talking about. The fanciest thing you'll find in the menu of a good Japanese is not a Bohemian Rhapsody made of Japanese ingredients, but a gohan kare (curry rice Japanese style), a Japanese pizza or perhaps Japanese pancake. I don't mean to say that Japanese kitchen can't reinvent itself and come up with new concepts or ideas, but not in the way you see in trendy mall restaurants. Finally, if you really don't have a clue whether you're in a good Japanese restaurant, a last-but-not-best indicator is price. Not a guarantee, but an indicator at most. Surprised that you can get a tuna nigiri set at Ai-Sushi for only 50 baht? Well, it's because the tuna taste like rubber and it's probably full of growth hormons. What you pay is what you get, quality has a price and if you really want fresh fragrant sashimi, you've got to pay for it. That doesn't mean that an expensive Jap is automatically good, there are plenty which aren't, but if the place isn't too fancy, you're paying for something and let's hope that's quality. My average spending in a real good Japanese is at least 600 baht if I go alone and around a thousand if I bring a friend. May sound expensive for a place like Chiang Mai, but it's still very cheap if you compare the quality to what you can get elsewhere in the world. Finally, a cute thing to notice in some but not all Japanese restaurants is when you get your money change back: crispy-fresh bank notes, unstained, unfolded just fresh from the press. I find it a delight. It's a little gesture and it shows remarkable eye for detail and care for customers, as you often find in Japan. I know for a lot of people, money is money and pecunia non olet so dirty or worn-out bank notes are fine. 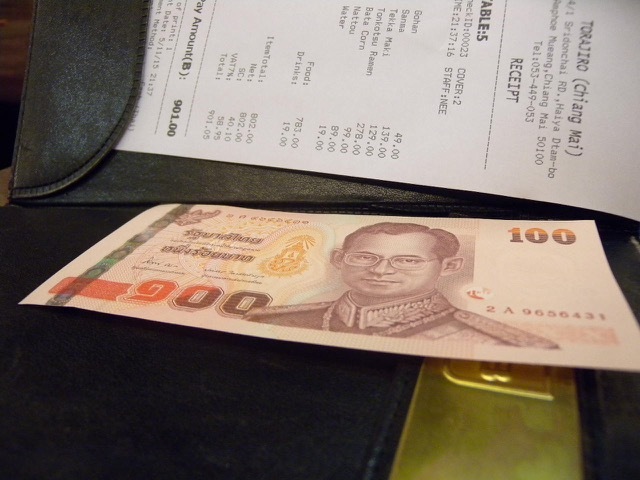 But to me it still leaves me with a good impression when I receive those fresh bank notes back as a change. This opinion article was written by one of our authors. Agree or disagree or have interesting ideas? Share it here as a comment or write some yourself on this website.